CEUs: .65 CA approved 40-H22 7.8 Hrs. This interactive course is in movie format. Back by popular demand! 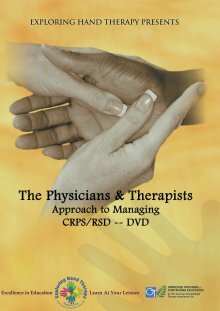 The Physicians and Therapists Approach to Comprehensive Evaluation and Management of CRPS/RSD awards 6.5 contact hours upon completion of course and exam. This course is excellent for occupational and physical therapists, therapy assistants and physicians and is at an intermediate learning level. The course instructors will present a comprehensive program for management of patients with RSD/CRPS. Learn about the medical and therapeutic modalities involved in evaluation and treatment of this condition. Learn tips, tricks and techniques you can use immediately in your clinical practice. Visual media includes video and leccture.. Upon successful completion of the examination (80%) your certificate will be sent via email. The course was informative and I used some of the treatment recommendations immediately in the clinic; for example, timing and documenting improved tolerance for the scrubbing activity and use of constant contact massage on both UE and LE with good benefit. Good course but a little stilted at times. Good info.